Greece is one of those magical destinations where we feel like you can’t really go wrong no matter which island you choose. Santorini is as romantic as can be, with its iconic whitewashed buildings and dramatic caldera. Rhodes has a rich history, beautiful beaches and one of the best-preserved fortresses in the world. Then, of course, there’s the mainland and Athens—a city a bit rough around the edges but which we thoroughly enjoyed exploring. 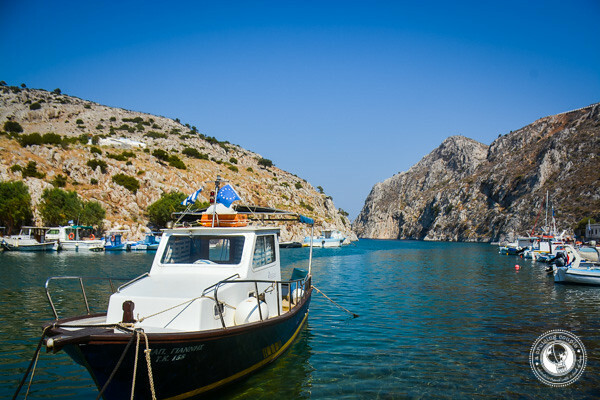 Yet of all the spots we visited in Greece, our favorite was without a doubt the small but beautiful island of Kalymnos. Kalymnos is a relatively off-the-beaten-track destination in Greece. Both Greeks and tourists seemed a bit surprised when we said Kalymnos was on our Dodecanese island hopping itinerary—and even more so when we said we fell completely in love with it. If you’re looking for raving nightlife and fancy clubs, then Kalymnos isn’t for you. 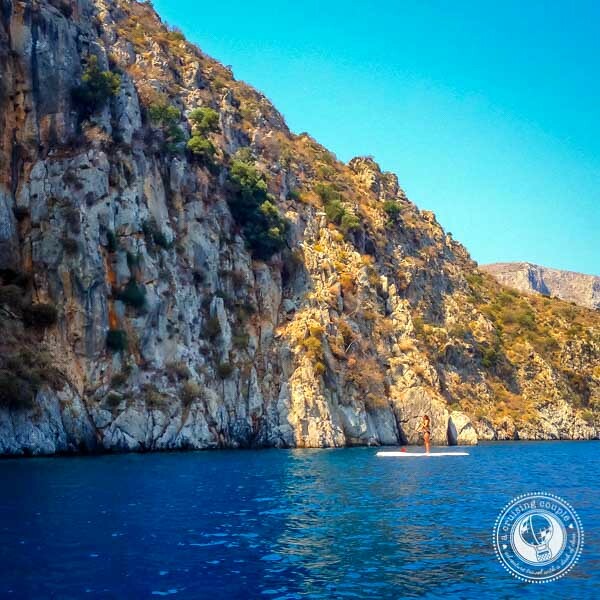 But if you’re after a unique Greek experience that offers plenty of adventure, cuisine and beauty, then we think you’ll love Kalymnos just as much as we did. Here’s everything you need to know to start exploring this fascinating spot. When arriving at Kalymnos, you’ll likely dock at Pothia, the main port and capital of the island. A statue of Poseidon and shops selling piles of sea sponges is a fitting welcome. For decades, Kalymnos was most well-known as the island of the sea-sponge harvesters. 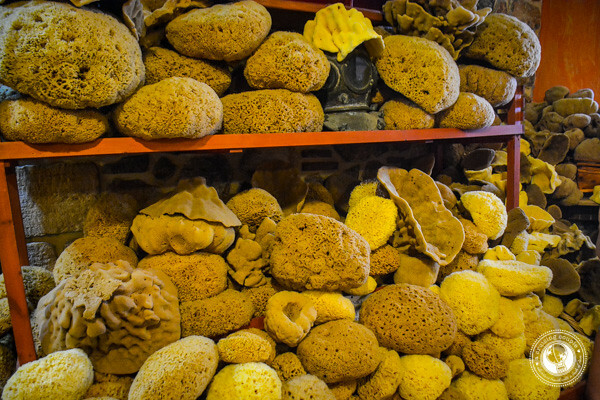 This centuries-old tradition was once the island’s primary source of income, and though the practice has declined, it’s still possible to purchase natural Mediterranean sea sponges of all shapes, sizes and quality. Pothia can be a bit hectic, and while there’s a lot of attractions worth returning for, we recommend renting a car or scooter and then escaping to stay at one of the tranquil seaside villages. Vathy was probably our favorite village. Resembling a fjord, here houses and shops dot a valley that extends into a turquoise gulf. The views are picturesque driving into the valley, as well as from the water looking back up at the surrounding mountains. 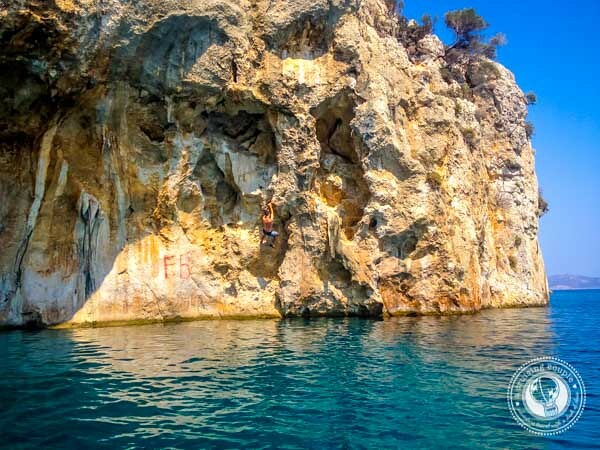 From Vathy, you have easy access to some of the best Deep Water Solo rock climbing. Emporio is a quaint and quiet town on the north side of the island. It’s the most remote and has few residents, but as a result, there’s a lovely sleepy feel to it. Emporio is also an excellent spot for a leisurely walk or a stop at an authentic cafe or tavern. There’s also a quiet local beach that’s excellent for escaping the crowds. This is one of the most popular tourist strips, though it’s still relatively quiet and low-key. There’s a small beach, as well as a number of cafes, tavernas and rock climbing shops. Boats to the islet of Telendos depart from here. Just a stone’s throw from Myrties, Massouri is another popular hub for tourists. Expect whitewashed houses, plenty of restaurants and amenities, and a lovely bay where you can swim and sunbathe. Here you’ll find a long stretch of beach that is popular with both locals and tourists. From here you can also walk to the monastery perched on the hill keeping watch over the town below. In addition to the beaches mentioned above, Platis Yialos (our favorite), Vlychadia Beach, Agios Nikolaos Beach and Ton Tochio Beach are popular spots for soaking in the sun and going for a swim. It’s worth noting the beaches on Kalymnos tend to be small and many have more pebbles than sand, but they still make nice spots to rent a chair and enjoy the views. For a complete list of Kalymnos’ beaches, check out this guide. The primary reason we decided to visit Kalymnos was the rock climbing. The island’s craggy mountains attract avid climbers from around the world. And with over 2,300 routes on the island, there are climbs for all levels. Many of the rock climbing shops offer multi-day climbing courses, where you can quite literally learn the ropes. There is also advanced private instruction available from certified instructors if you want some quality one-on-one coaching. 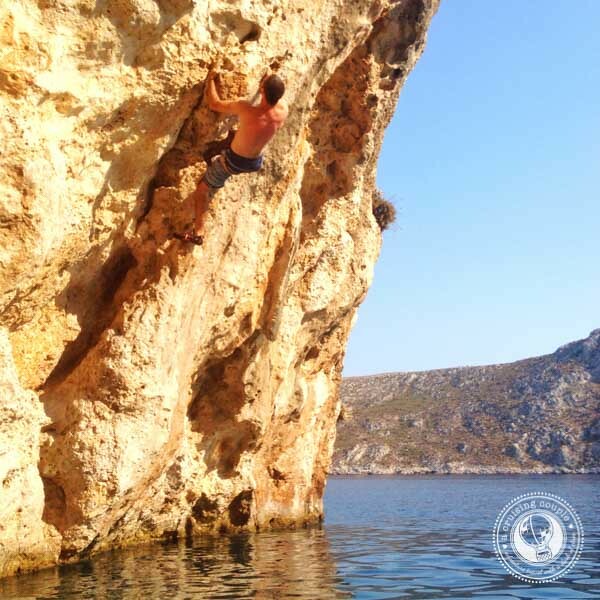 If you’re an experienced rock climber, then you can also check out the community board in front of the Kalymnos Adventure Center to find some climbing buddies and head out on your own custom adventures. We opted to Deep Water Solo as it let us combine a day of kayaking, SUP, and rock climbing while being out on the water. Some of the best deep water soloing is accessible from Vathy. Just a short kayak or paddleboard away is a cave with great deep water soloing routes for all levels and abilities. We recommend renting a standup paddleboard or a kayak from the shop at the end of the pier. The cost is 5 or 6 euros per hour depending on what you rent. Take your time and enjoy the beautiful scenery, maybe even trying some SUP yoga while you’re at it! There are also other scenic spots you can enjoy paddling to if rock climbing isn’t of interest. Note that you can rent shoes and harnesses from most rock climbing shops, but not ropes. You’ll need to bring your own, buy one while you’re here, or find a buddy to share. Given Kalymnos’ long history of diving for sea sponges, it’s hardly any surprise that the island still attracts those wanting to explore the underwater world. Kalymnos Diving Club leads wreck dives in the warm waters just off the island. You can also swim through caves or try to spot octopi, dolphins, sponges and fish. If you want to enjoy the sea but also stay dry, then Mikros Kosmos boat trips are one of the best options. 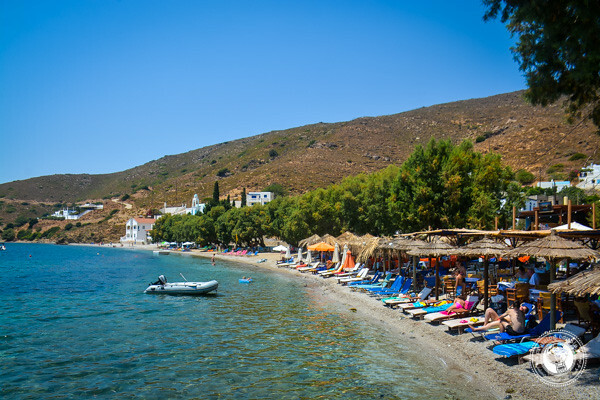 From the main harbor at Pothia, you’ll sail past uninhabited islands and stop at scenic bays for swimming and lunch. Keep your eyes peeled for dolphins along the way! 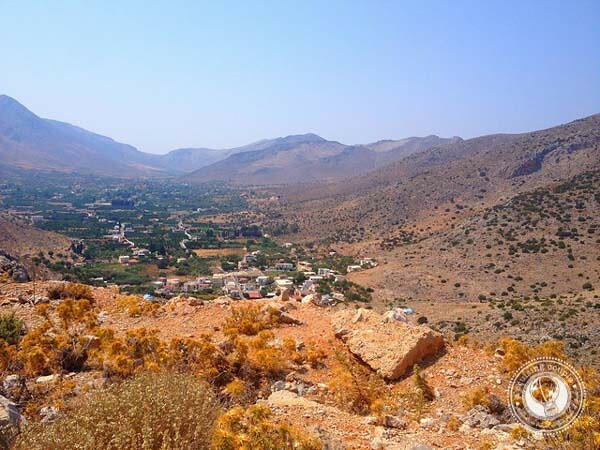 Kalymnos’ unique landscape means that there are plenty of opportunities for scenic hikes throughout the island. 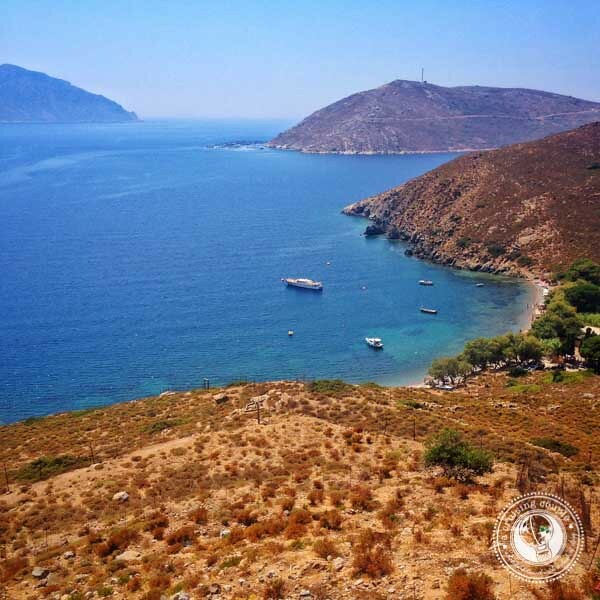 Avid hikers will want to download the Kalymnos Hiking App. Perhaps the most popular walk is The Italian Road, a leisurely three-hour hike from Pothia to Vathy. The stone path offers fantastic views on both sides of the trail. If you find you need some travel shoes before embarking hover here for more info. Agios Savvas Monastery is a beautiful monastery that looks out over Pothia harbor. It’s possible to hike to the top of the monastery, though be forewarned it is a pretty steep climb. 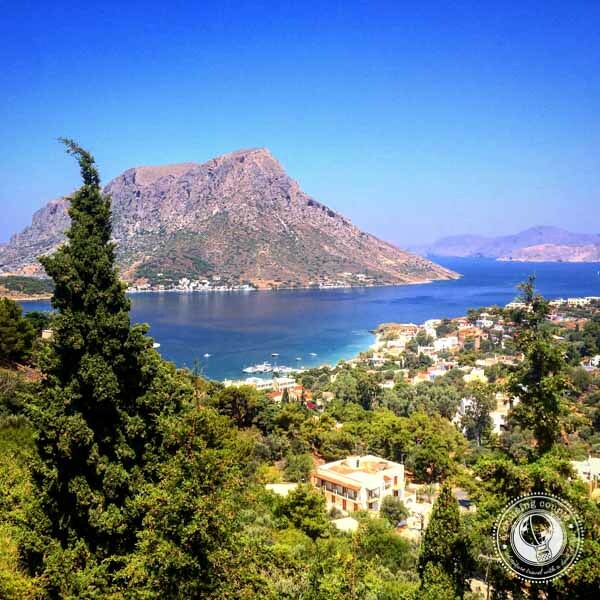 In addition to the Agios Savvas Monastery, other popular attractions include the Neoklasiko Private Folklore and Historical Collections Museum, the Archaeological Museum of Kalymnos and the Sea World Museum Valsamidis. We didn’t do much museum hopping, though we did stop by the Factory of Natural Sea Sponges to pick up some Mediterranean sea sponges. These things make the best natural loofahs, and definitely leave your skin feeling soft and clean. For a real treat, check out this Half-Day Kalymnos Food and History Tour in which a local guide takes you to some hot spots around the island as well as preparing and tasting local home-made delicacies and learning first-hand the intricacies of Kalymnian cuisine. It’s no secret we love food tours. Every single one we have done, from Paris to Hong Kong to Boston, has been a highlight of our trip. We didn’t know about this Kalymnos food tour, unfortunately, but we will definitely be giving it a try the next time we visit Kalymnos! Finally, be sure to stop by the Castle of Chora. This 15th-century fortress and village is nestled into a steep mountain. The ruins are an interesting place to explore with phenomenal views. Discover more of the best holiday deals & offers in Kalymnos and other top destinations here. Mouri: Perhaps Kalymnos’ biggest claim to fame, this is a baked stuffed-lamb traditionally served on Easter and special events. Galaktoboureko: A popular custard and fill dessert. Top it off with the island’s amazing thyme-scented honey! I’m not sure we had a bad meal the entire time we were in Kalymnos. That said, Medusa by the Sea was probably our favorite restaurant (also conventionally located in Vathys, our favorite spot on the island.) Harry’s Paradise Garden Restaurant is another popular spot, along with Aegean Tavern and Smugglers. We stayed at a lovely guesthouse we found off AirBnb and highly recommend taking this route if you want a true Greek-living experience. While there weren’t any frills, the owner was absolutely lovely. It felt more like we were staying at a long-lost Greek grandma’s house then a guesthouse. We love staying at AirBnb around the world, especially when we’re looking for spacious apartments on a budget. If you haven’t tried AirBnB yet, sign up using this link and get $20 off your first stay! This stunning hotel is a romantic spot offering excellent value and comfortable apartments. Expect spacious balconies and phenomenal views of Telendos Island. There’s a quiet and idyllic beach just five minutes from the hotel, making it the perfect escape if you want to soak in the sun without all the crowds. There’s also an on-site fitness center and pool. Easily one of the best values on Kalymnos, it’s hardly any wonder Panorama Studios and Apartments always receive raving reviews. The hotel boasts a prime location, making it easy to access all the highlights on the island. It’s an especially popular spot with climbers, but the studios are well-suited to any traveler. For just a bit more you can enjoy a room with a sweeping sea view. You can also find good hotel and travel deals to save money here. There you have it: Your ultimate Kalymnos Travel Guide! Now, as always, we want to hear from you! Have you been to the island of Kalymnos? Would Kalymnos make your Greek island-hopping itinerary? Kalymnos is such a great place to visit. Thanks for sharing. Your photos are stunning. Woah ! This place is very beautiful. Thank for pictures. That’s not Dan climbing in the photo is it? Always choose the SUP… you can’t conveniently swim from a kayak in open water. White Kayak is just awesome. All the images look really amazing. I would love to go there in near future!